The New Year at Rosecrest Farm is the biggest of times, yet the quietest of times. It’s a big deal because the babies aren’t babies anymore. As most of you know, Thoroughbreds all celebrate their birthday on January 1st. So the weanlings all became yearlings. It’s big, because there’s just a month to go before the craziness begins. Mares start foaling, trips to the breeding sheds begin and our vet seems like a permanent fixture at the farm. Certainly Chuck and I don’t go anywhere!!! Horses seldom seem to mind the weather! But this is the calm before the storm and it’s a good time to catch up on who’s where…. 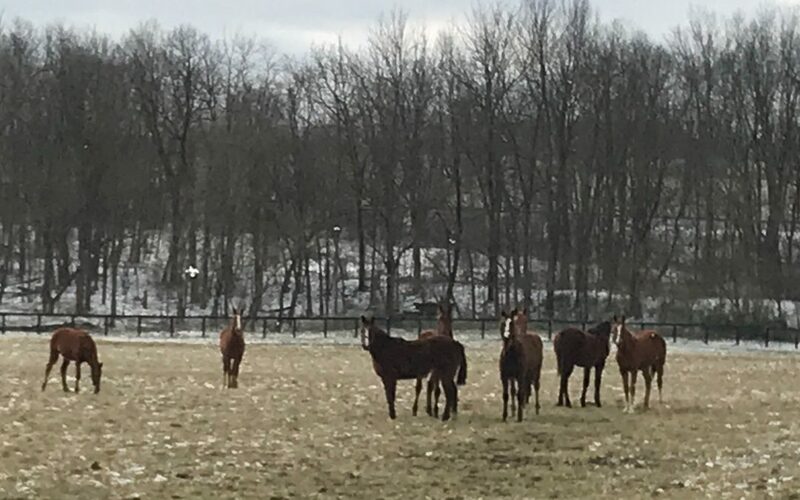 We have eight now-yearling fillies and colts at the farm and, yes, they are very full of themselves – just like most talented teenagers. Seeing them sprint across the fields is a thrilling sight that warms the heart. 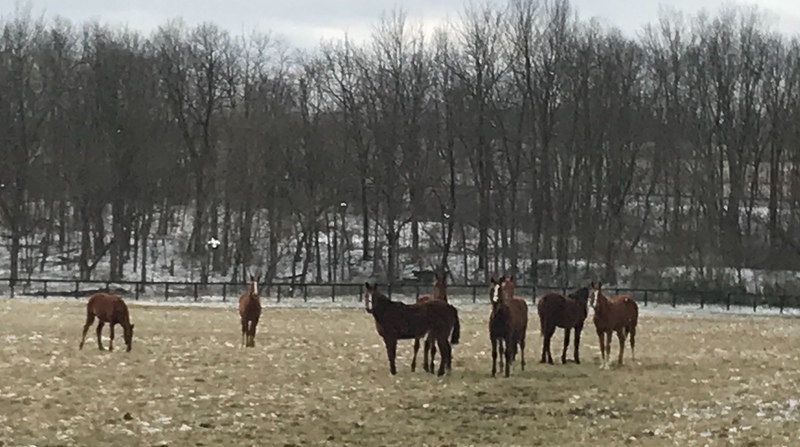 We have five 2-year-olds — three fillies and two colts. They have been saddle broke and are enjoying being ridden. And it’s fun for us to see them taking these beginning steps on their careers. So far, they are enjoying their next job of being a race horse. We have one 2-year-old who needs a name. It’s our filly by Strong Mandate, out of Charley’s Hope. So far she’s been named Charley’s Hope 17, or just “Charley”, but it’s time for that to change. How about some ideas from our friends???? 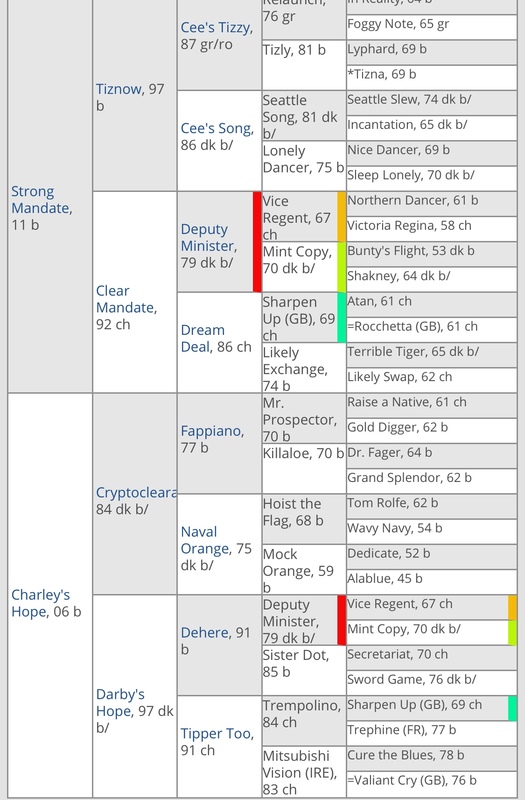 5-cross pedigree of our Strong Mandate / Charley’s Hope filly. For those of you into background, here’s a snap of her 5-cross pedigree. For those of you who are new to this naming thing, names can be no longer than 18 characters, including spaces and here’s a link to an article about more of the do’s and don’ts that you can Click here to read. 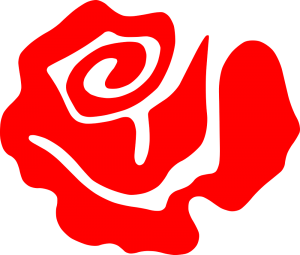 Oh, and we do have a tradition of all our homebred fillies having “Rose” in their name! Thanks, in advance, for your help. You can submit suggestions by responding to this blog post or by posting on our Rosecrest Farm Facebook page. 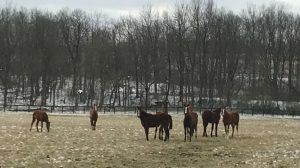 We have nine barren mares who will be bred this year – three for the very first time… another life change for them. And there are fourteen pregnant mares who will be keeping us busy. Projected foaling dates range from January 23rd to May 6th. As usual, I’ll be keeping you posted as the girls progress, and babies arrive. Oooooooooops. I didn’t get this written quickly enough. 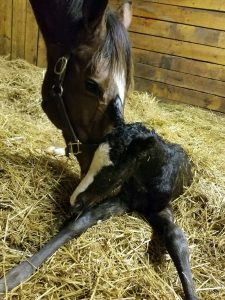 We have our first baby! The new arrival is a very feisty filly by Dialed In. She weighed 102 pounds and is gaining two or three pounds a day (she likes to eat). Unbridled Reward and her baby girl. 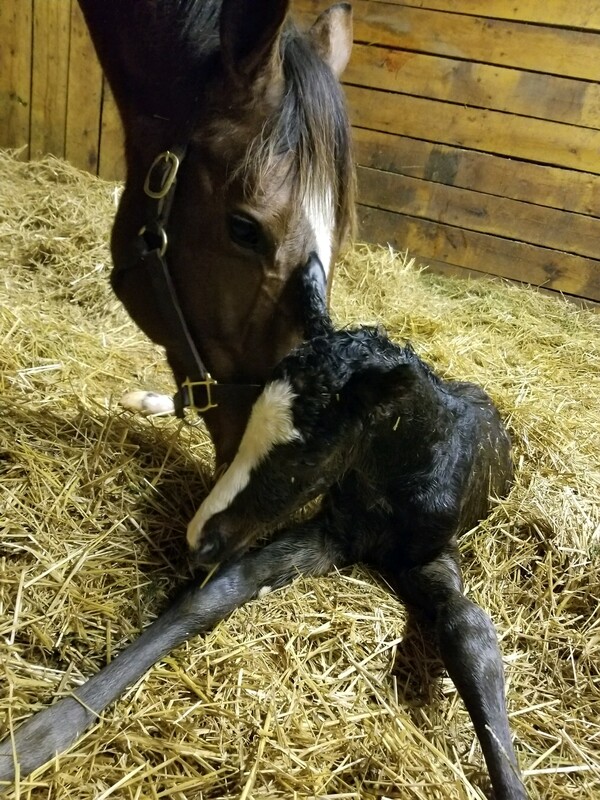 Mom (Unbridled Reward) and baby are doing great. Mom’s a little protective, as many are at this stage but this filly loves going out and leads the way and doesn’t seem to really care where her mom is. So… one down and thirteen to go! I pray they all will be this healthy. Back to horses on the farm. The Retirees are doing well. Darby’s Hope is the oldest at 22. Gone West Princess and Tigress Woods are both 20. Unfortunately the latter two are really feeling their arthritis. Tinner’s Storm is 19 and runs around like a teenager. Last, but certainly not least, I’m proud to give you an update on GOLDENCENTS. He finished the year with by far the most winners (29) of the first year sires, and second on the list of first year sires by earnings. Not many pundits (pedigree experts) picked our boy to be one of this year’s Top Freshman Sires. He led the list all year long until Cross Traffic’s daughter Jaywalk won the Breeders’ Cup Juvenile Fillies. Goldencents also had the most starters of any of the first year sires, with 71. All that speaks volumes as to Goldie’s kids inheriting his precocity and hardiness. 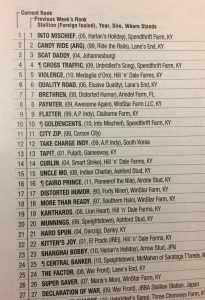 The BloodHorse list of North American Leading Sires of 2-year-olds for 2018. 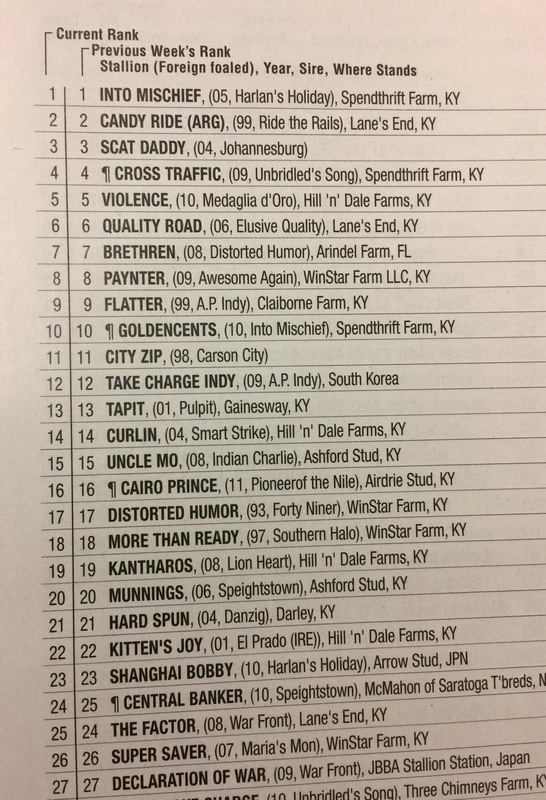 Add to that Goldencents’ daddy, INTO MISCHIEF, is #1 among ALL sires of 2-year-olds for 2018, and Goldencents is # 10 on that prestigious list. And the icing on the cake is the bigname stallions (see BloodHorse 2018 Leading Sires of Two-Year-Olds at left) they both finished ahead of. We’re very, very, VERY proud of our boy! If you’re looking for a name, I’ll throw Charley’s Rose into the mix. Just love how Goldencents has been so successful. I follow as many of his babies as I can and know about. This brand new filly is just so cute. I love that she is such a little piggy with her appetite. I’m going to try and think of a name after studying the pedigree. Goldencents is and will always be a special horse for me. I like Hope Runs Strong.